Size 18 x 24 inches. This is a high quality Giclée Poster. 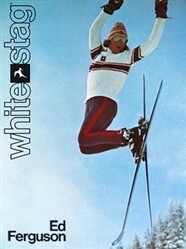 “Airborne” Eddie Ferguson, a Freestyle legend, was the perfect skier to use in advertising White Stag Skiing Apparel. Freestyle skiing began in the 1930s, when Norwegian skiers began performing acrobatics during alpine and cross-country training. Organized freestyle skiing started in the mogul fields, the bumpy natural terrain that allowed skiers to show off with tricks, jumps and incredible turning abilities – freestyle mogul skiers were “hot-doggers” in the day. 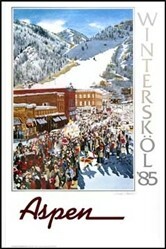 In 1971, Aspen, Colorado, hosted a small mogul competition on the legendary Ridge of Bell, one of the most challenging mogul runs in the country. As the sport quickly evolved, hot-shot mogul skiers like John Clendenin, Scott Brooksbank, Bill O’Leary and “AIRBORNE” EDDIE FERGUSON gave rise to the sport. 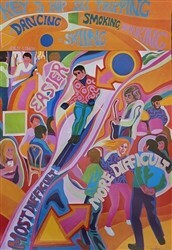 The International Ski Federation (ISF) recognized freestyle as a sport in 1979 and brought in new regulations regarding certification of athletes and jump techniques in an effort to curb the dangerous elements of the competitions. 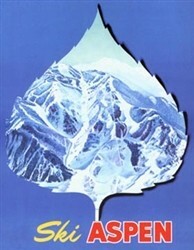 The first World Cup series was staged in 1980 and the first World Championships took place in 1986 in Tignes, France. The White Stag company began as an offshoot of the Hirsch-Weis Manufacturing Company of Portland, Oregon, which made durable outdoor clothing and supplies worn by loggers, mill hands, and stockmen. For 38 years a sign in Portland advertised White Stag Sportswear. In 1929, Harold S. Hirsch, Max’s 21-year old son, returned to Portland after graduating from Dartmouth College, where he had been a member of the school’s ski team. He began making downhill skiing apparel, starting with a ski suit, which Hirsch-Weis began marketing in 1931 as White Stag, from the literal English translation of the parent company’s names Weis and Hirsch. In 1966, White Stag was purchased by the Warner Brothers Company, which later became the Warnaco Group. White Stag is now sold at Wal-Mart, what a change! Poster Size 18 x 24 inches.